Division faculty conduct cutting-edge research in a range of clinical disciplines including pediatrics, radiology, pathology and nursing practice. They also utilize devices, data and information to better serve the needs of the public, the nation and the world. This effort involves innovation at a number of levels: understanding information needs, designing information models, deploying systems, and evaluating their impacts. Dr. Harold P. Lehmann is a board-certified general pediatrician with doctoral informatics training from Stanford. He leads the Division as Interim Director. His research concerns evidence-based medicine (EBM) broadly conceived. His current work focuses on the informatics infrastructure of research and the secondary use of EHR data for research. He is also interested in other sorts of "evidence", and is evaluating the value to community health workers of classic evidence reports vs social media (vs links to community services). He leads the Johns Hopkins efforts in informatics training across all three schools of health sciences.He has served as an Associate Editor for the Journal of the American Medical Informatics Association since 2011. Dr. Ball is a member of the Institute of Medicine (IOM), now named the National Academy of Medicine (NAM), serves on the Board of Health on the Net (HON) in Geneva, Switzerland, is Co-Chair of the TIGER HIMSS Committee, and was elected to membership of the IBM Industry Academy. She has also served on a variety of boards in the area of health information technology: the Board of Regents of the National Library of Medicine (NLM), as President of the International Medical Informatics Association (IMIA), as a board member of the American Medical Informatics Association (AMIA), College of Health Information Management Executives (CHIME), American Health Information Management Association (AHIMA), and Co-Chaired the Health Information Management Systems Society (HIMSS) Board, and also served as Board Co-Chair of the TIGER Foundation. She received the Morris F. Collen Lifetime Achievement Award from ACMI/AMIA, and is an honorary member of Sigma Theta Tau, the Honor Society of Nursing, and the Medical Library Association (MLA), and was inducted as an Honorary Fellow of the American Academy of Nursing (AAN). She received the Award of Excellence, an International Medical Informatics Association (IMIA) Lifetime Achievement award. In 2011, she was selected as one of the 50 most influential IT professionals over the last 50 years by HIMSS. And in 2017, she was recognized by HIMSS as one of The Most Influential Women in Health IT, and also named as one of the Most Powerful Women in Healthcare IT by Health Data Management. In addition, she was elected to the International Academy of Health Sciences Informatics (IAHSI).She is the author/editor of over 20 books and over 225 articles in the field of Health Informatics. Her book, Consumer Informatics, received the HIMSS Book-of-the-Year Award. Several previous editions of the nursing books have been translated into Chinese, Portuguese, Japanese, German, Korean, and Polish. The 4th Edition entitled Nursing Informatics: Where Technology and Caring Meet was published in January 2011. In 2014, the 4th Edition of the Introduction of Nursing Informatics was published. In 2015, she published four books, among which is The History of Medical Informatics in the United States with Dr. Morrie Collen as well as the 4th Edition of Healthcare Information Management Systems. Dr. Boland's background includes training in electrical and computer engineering as well as clinical ophthalmology with sub-specialization in glaucoma. His research interests serve to bring these two areas together. 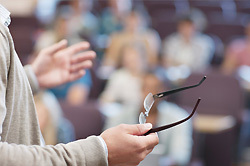 Prior and recent projects include evaluation of the impact of clinical information systems on the practice of medicine, the impact of computerized decision support on physician decision making, automated analysis of quantitative clinical data to improve the diagnosis and management of glaucoma, and the impact of automated, telecommunication-based reminders on patient adherence with glaucoma medications. Dr. Ashwini Davison is the Associate Director of Education for the Division of Health Sciences Informatics. She is board-certified in Internal Medicine with subspecialty certification in Clinical Informatics. Her research interests are in the use of EHR simulations for training and assessment in medical education as well as in studying the additive value of novel data sources for case identification and predictive analytics. Dr. Davison has a wealth of applied informatics experiences in clinical algorithm development, digital innovation, and population health IT. Her career has spanned numerous roles in leadership and advising with a wide range of organizations ranging from startups and large corporations to government contractors and non-profits. She is the Course Director for a medical student course on Informatics & Digital Health as well as Co-Director for the DHSI course Leading Change Through Health IT. She has developed and directed innovative online programs in the School of Public Health and has been recognized for Excellence in Teaching for her course Essentials of Population Health Management. She is on the admissions committee for the Online Program in Applied Learning (OPAL). Dr. Davison is an Assistant Professor in General Internal Medicine with appointments at DHSI and in Health Policy and Management as well. She received her undergraduate degree from Stanford, her medical degree from UCLA and trained in the Osler Internal Medicine residency program here at Hopkins. Mark Dredze is an Assistant Research Professor in Computer Science at the Johns Hopkins University and a research scientist at the Human Language Technology Center of Excellence. He also is affiliated with the Center for Language and Speech Processing and the Center for Population Health Information Technology, and is a member of Health Sciences Informatics in the School of Medicine. His research in natural language processing and machine learning has focused on graphical models, semi-supervised learning, information extraction, large-scale learning and speech processing. His recent work includes health information applications, including information extraction from social media, biomedical and clinical texts. He earned his B.S. (’03) from Northwestern University; his M.S. (’04) from Yeshiva University and his Ph.D. (’09) from the University of Pennsylvania. Dr. Duval-Arnould is on the faculty of the Johns Hopkins University School of Medicine. His primary appointment is in the Department of Anesthesiology and Critical Care Medicine, and he holds a joint-appointment in the Division of Health Sciences Informatics. He serves on the hospital-wide and pediatric CPR committees and is the Director of Research and Innovation within the Johns Hopkins Medicine Simulation Center. Jordan was certified as an EMT in 2006 marking the beginning of a transition from a career in software development to one in medicine. Jordan earned an MPH and DrPH from the Johns Hopkins University School of Public Health. During his doctoral education he was a National Library of Medicine Informatics fellow, as well as the inaugural Johns Hopkins Medicine Simulation fellow. Dr. Duval-Arnould has advanced training and experience in informatics, epidemiology, biostatistics, and medical simulation. Jordan is driven to advance pediatric resuscitation science. He has co-authored scholarly works centered on resuscitation, technology, and simulation-based research and training, and has presented his work both nationally and internationally. He has been involved in several multi-institutional endeavors to identify how technology can be used to increase resuscitation research efficiency and reliability. He combines these interests in his volunteer capacity as the Young Investigator member of the American Heart Association's Pediatric Research Task Force, a Co-Investigator on the Quality of Pediatric Resuscitation in a Multicenter Collaborative (pediRES-Q) initiative, and as a founding Executive Committee member of the International Network for Simulation-based Pediatric Innovation, Research, & Education (INSPIRE) organization. Dr. Hadi Kharrazi is the assistant professor of Health Policy and Management at the Johns Hopkins Bloomberg School of Public Health with a joint appointment at the Johns Hopkins School of Medicine. He is the assistant director of the Johns Hopkins Center for Population Health IT (CPHIT) and serves on the Public Health Informatics Working Group Executive Committee of the American Medical Informatics Association (PHI-WG AMIA). As the assistant director of CPHIT, Dr. Kharrazi is pursuing priority Population Health Informatics (PHI) research interests that provide direct population-based applications to providers, patients, and payers. His research focuses on leveraging informatics to advance population health and improve cost. He is currently the PI of two AHRQ grants with special focus on population health: (1) an R21 grant to develop and evaluate a 30-day hospital readmission prediction model based on HIE data in Maryland; (2) a, ACTION-II contract to evaluate population health / coordination stages 3 of EHR ‘Meaningful Use’ measures. He is actively involved in various quality metrics projects including a CMS subcontract to evaluate overuse measures and a VA contract to develop a comprehensive data-driven population health framework. He is also currently engaged with Maryland’s Department of Health and Mental Hygiene to develop and pilot advanced population health metrics based on state-wide EHR data. Paul Nagy, PhD currently is an Associate Professor in the Johns Hopkins University Schools of Medicine (Russell H. Morgan Department of Radiology) and the Bloomberg School of Public Health, and Division of Health Science Informatics. He earned his Doctorate’s degree in diagnostic medical physics from the Medical College of Wisconsin. He runs an immersive technology development center where his research interests include studying the use of information technology to improve the quality of healthcare. At Johns Hopkins, Dr. Nagy serves as the director of quality in the Department of Radiology and the director of informatics for the Armstrong Institute for Patient Safety and Quality. Dr. Nagy is the author of over 90 papers in the fields of informatics and quality. He serves as the program director for three multidisciplinary leadership programs at Johns Hopkins Medicine in clinical informatics, patient safety and quality as well as clinical analytics. Dr. Nagy served the National Quality Forum on their Patient Safety Steering Committee as well as the American Medical Association on the Physician Consortium for Performance Improvement. He currently serves on the Board of Health for Howard County and the Board of Trustees for the Society of Imaging Informatics in Medicine. From 2010-2012 he served as the chair of the American Board of Imaging Informatics (ABII) which has over 1,000 diplomats. He participates on national standard-setting bodies (DICOM and IHE) as well as informatics committees for RSNA, ACR, AAPM, and SIIM. Dr. Nagy is currently the associate editor for the Journal of Digital Imaging and writes a column on quality and safety in the Journal of the American College of Radiology. In 2012, he was inducted into the college of fellows for the Society of Imaging Informatics in Medicine. David Newman-Toker received his B.S. from Yale University and his M.D. from the University of Pennsylvania School of Medicine. After completing his Neurology residency at the Massachusetts General Hospital, he went on to complete fellowships in Neuro-ophthalmology at the Harvard University / Massachusetts Eye & Ear Infirmary and in Neuro-otology at the Johns Hopkins University School of Medicine. He completed his doctoral training in Clinical Investigation at the Johns Hopkins Bloomberg School of Public Health. Dr. Newman-Toker’s research focuses on recognition and prevention of diagnostic errors in frontline healthcare settings using informatics tools at the point of care. He is currently conducting a study on the misdiagnosis of dizzy patients in the Emergency Department. Research methods employed by his group include prospective cross-sectional,observational cohort, and case-control studies, as well as surveys and systematic literature reviews.